"Manali and the hills overlooking it experienced mild to moderate snow. So is Dalhousie and Kalpa," a Met official said. Shimla residents shivered as icy winds brought down the minimum temperature to minus 1.1 degrees Celsius. Shimla was still recovering from Tuesday's heaviest snowfall of the season. "High-altitude areas of Lahaul and Spiti, Chamba, Mandi, Kullu, Kinnaur and Shimla districts have been experiencing intermittent snow since Tuesday," the official added. 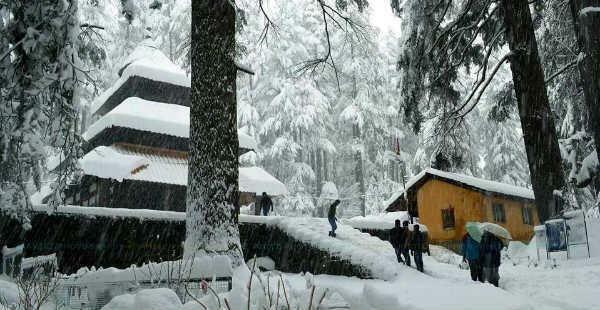 "We are hopeful of getting good number of tourists this weekend in Shimla and nearby areas after this snowfall," D.P. Bhatia, liaison officer with Shimla-based Oberoi Group of hotels, said. "The road link to towns in upper Shimla is likely to be restored by Thursday evening," he said. Officials said the road network in the higher reaches of Kinnaur, Shimla, Chamba, Mandi, Kullu and Sirmaur districts was worst affected after Tuesday's heavy snowfall and efforts were being made to reopen it.